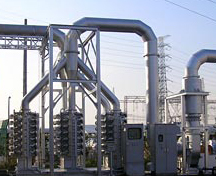 ﻿ FIRE-RESISTANCE TEST EQUIPMENT｜SRD HOLDINGS Ltd.｜SAKAMOTO INDUSTRY CO.,LTD. 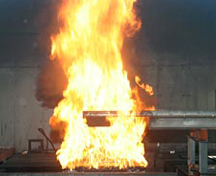 A leading domestic fireproofing test plant promotes vehicle safety. 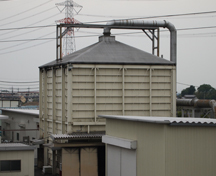 Of the various testing equipment owned by SAKAMOTO INDUSTRY, the fireproofing test plant is one of the leading facilities in Japan. For testing plastic fuel tanks, in particular, this plant can handle each of the five test items (fireproofing, heat-proofing, vibration-proofing, pressure resistance, and fuel permeability) defined in the TRIAS new vehicle test methods, as well as fireproofing testing. When a new vehicle is launched, it must clear these tests and the results have to be submitted to the Ministry of Land, Infrastructure and Transport. This is the only facility in Japan able to conduct the entire suite of tests on plastic fuel tanks in one location. Consequently, many other automobile manufacturers also use this facility. Fireproofing tests on fuel tanks are conducted by attaching a fuel tank containing gasoline to an automobile which is tested while recreating conditions as close as possible to actual driving conditions.